Ragdolls exist in different colors and patterns. There are 62 different colorcombinations possible. They are based on 6 colors and 5 different patterns. On this page we want to give you a tour of the different colors and patterns. We are going to do this using pictures and drawings. Click on the color of your choice and you will immediately see some pictures with a describing text. All pictures are taken with permission of the owners. 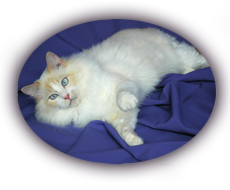 The colorpoint ragdoll is your basic pointed cat. Colorpoints have darker point colors on their ears, tail, legs and mask with a lighter variation of the same color to their body. Colorpoint ragdolls have no white on them. Their nose and footpads are the same color as their points. 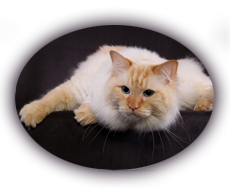 The mitted ragdoll has all the basics of the colorpoint but with a little extra. 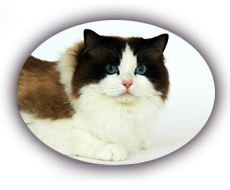 The mitted has matching white mittens on the front feet and white boots extending about mid-thigh on the back legs. 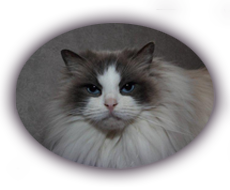 The mitted ragdoll also has a white chin and chest with a white strip of varying widths running down the belly and lower abdomen. Mitteds may also have a blaze of white on their forehead and/or nose. The nose and footpads are the same color as their points. 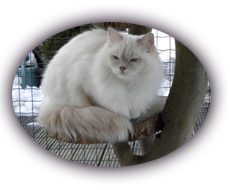 The bicolor ragdoll is the flashiest of the tree patterns. Bicolor meaning two colors have darker points to their ears, tail, and mask with their backs displaying a saddle with a lighter variation of the same color. The bicolor has an inverted white “V” of varying heights and widths inside of the mask on their face. Their chins, chest, front and back legs and belly are mostly or all white. The nose and footpads must be pink. A tortie will always be a girl. 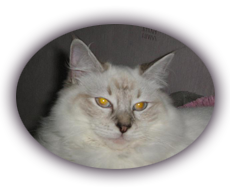 Torties has a normal colorpoint, mitted or bicolor base with patches of cream mixed in. Due to the unpredictable placement of the cream color, each tortie is a beautiful unique individual. Lynx is an addition to the colors. The lynx pattern shows itself as a tabby drawing in the letter W on the forehead and stripes on the legs and tail. The lynx has a very light pink nose with dark colored nose edges. The blue eyes are accentuated by the with coloring around the eyes and the ears have white inside. Torbie is a tortie pattern mixed with a lynx pattern.